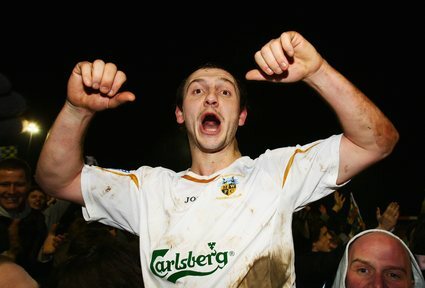 Havant & Waterlooville’s Shaun Wilkinson celebrates last night’s 4-2 victory against Swansea, which set up a dream FA Cup fourth-round tie against Liverpool. The Blue Square South outfit went 3-0 up against the League One side. They travel to Anfield on Saturday, January 26.